Students, alumni, staff and enterprise educators came together to celebrate famed programmer Ada Lovelace at an event hosted by London South Bank University’s (LSBU) Informatics Society. The celebration was catered with birthday cakes made by LSBU National Bakery School students and included an app-athon as part of the UK’s Rosalind Franklin National App competition. Students worked in teams to come up with ideas for a phone app to empower women in science, technology, engineering and medicine (STEM). “We celebrated Ada Lovelace, first female programmer and accomplished Mathematician, to raise awareness of notable women in STEM and to actively encourage our students to take their ideas forward,” said Safia Barikzai, Senior Lecturer in Informatics. 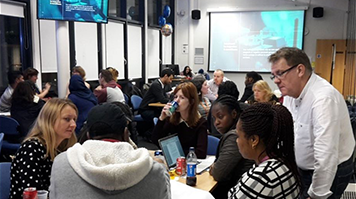 The app-athon was supported by LSBU alumni mentors and educators from the International Entrepreneurship Educators Programme (IEEP), as well as LSBU’s Entrepreneurship and Innovation Institute. “We want to support our female students to develop their enterprise skills and start their own businesses. Inspirational role models are a key part of encouraging women to think about enterprise and Ada was a great example of an entrepreneurial woman,” said Linsey Cole, Head of the Entrepreneurship and Innovation Institute at LSBU. LSBU is committed to promoting gender equality across all of its academic disciplines. The University was recently awarded a grant from Enterprise Educators UK to conduct a pilot study to identify the barriers preventing under-represented groups from engaging with enterprise and entrepreneurship.